HCM CITY — HCM City must develop a roadmap to restrict the use of personal vehicles, especially motorbikes, experts have urged. The boom in the number of motorbikes in Việt Nam has been attributed to the authorities’ failure in developing public transport, he said. “There are a number of misconceptions among personal vehicle users. They say the Government must develop advanced public transport before demanding that citizens stop using personal vehicles,” Nam said. He said that businesses were reluctant to take risks and invest in public buses, and most people preferred using personal vehicles because of convenience. However, since the streets in the city are packed with motorbikes, there will be no space left to operate more buses unless action is taken. Buses and motorbikes do not co-exist well, as motorbikes are not viewed as a safe and comfortable means of transport, he said. Public buses would be the best substitution to meet travel demand, he added. Dr Phạm Xuân Mai, former head of the Traffic Engineering Department at HCM City Polytechnic University, said he had discussed the traffic issue at many seminars in the last 15 years, but the city has not resolved the problem, while the number of motorbikes has increased day after day. To resolve the problem, the Government should create “obstacles” for personal vehicle commuters, which would encourage the use of public transport, he added. For example, commuters on motorbikes should never be allowed to park their bikes or autos in the centre of the city, he said, adding that they should be required to walk for 15- 30 minutes to their destination. Nam said the city should improve the public bus system as it steps up efforts to restrict the use of personal vehicles. The first subway line of the metro will not be available for another three years, he added. Based on experience in public transport in Hong Kong and Singapore, a subway alone cannot meet travel demand of people in HCM City. Public buses can resolve traffic congestion effectively, Nam said. Worsening traffic congestion has been caused by poor management, short-term planning, and overloading of vehicles on most roads in the city, especially during rush hour. Nam said the city should improve road infrastructure and better manage urban planning, especially land use. To do it effectively, the city should conduct research on consumer demand for travel, improve co-operation among agencies, and develop a master plan for traffic with a clear roadmap, he said. The number of personal vehicles has increased over the years. 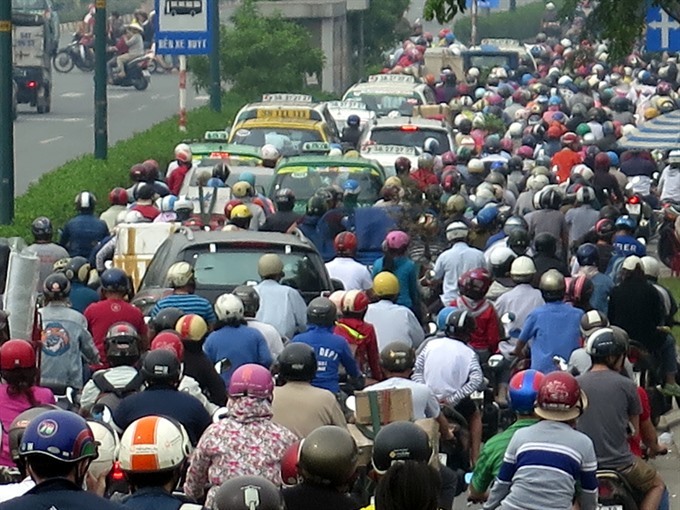 In 2010, HCM City had 4.89 million personal vehicles, including 440,000 cars and 4.45 million motorbikes. In 2013, the city had 6.4 million personal vehicles, of which 5.87 million were motorbikes, accounting for 91.7 per cent of the total number of vehicles. The rest were automobiles. By November 2014, the number of personal vehicles had increased to 6.95 million, including 580,000 automobiles and 6.37 million motorbikes. As of last month, the city had nearly 8 million vehicles, of which motorbikes accounted for 92 per cent of the total vehicles. The number of motorbikes increased by 5.4 per cent compared to the same period last year. Last year, the number of passengers using public buses was only 567 million, a drop of 1.39 per cent over the previous year, according to the Department of Transport. Most families in HCM City own at least one motorbike. Bùi Xuân Cường, deputy director of the Department of Transport, said the department would take into consideration all the measures proposed at the seminar. The department has submitted a plan on restricting the use of personal vehicles. Under the plan, a special consumption tariff and other fees imposed on personal vehicles would be raised, and an environmental fee (to mitigate air and noise pollution caused by personal vehicles) would also be applied. The department plans to limit the number of newly licensed vehicles through an annual quota, and require each citizen who wants to buy a new motorbike or car to bid for vehicle ownership. Once approved for ownership, they will be required to pay a fee to drive the vehicle. Those who live in inner HCM City must prove that they have access to parking space before they register the car for use. The city’s Department of Transportation has also proposed setting a deadline for motorbike use to cut down on air pollution.